The Lemonheads are an American alternative rock band formed in 1983 by the singer/guitarist, Evan Dando, who has been the band's only constant member. Since forming, recording, and touring lineups of the band have also included co-founders Ben Deily and Jesse Peretz, John Strohm (Blake Babies), Doug Trachten, Corey Loog Brennan, Byron Hoag, Ben Daughtry, Juliana Hatfield (Blake Babies), Nic Dalton (Godstar, Sneeze, The Plunderers), Dave Ryan, Patrick "Murph" Murphy (Dinosaur Jr), Bill Gibson (Eastern Dark), Mark 'Budola' Newman, Kenny Lyon, Vess Ruhtenberg, Devon Ashley, Karl Alvarez and Bill Stevenson (Descendents), P. David Hazel and various others. 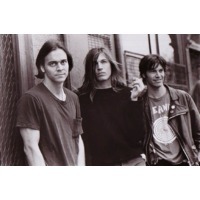 The Lemonheads' popularity grew in 1992 with the album It's a Shame about Ray, which was produced, engineered, and mixed by The Robb Brothers (Bruce Robb, Dee, and Joe), followed by a cover of Simon and Garfunkel's "Mrs. Robinson", which eventually became one of the band's most successful singles. The Lemonheads were active until 1997 and went on hiatus, but reformed with a new lineup in 2005 and released The Lemonheads in the following year. The band released its latest album, Varshons, in June 2009.